Mayavi is an interactive 3D plotting package. 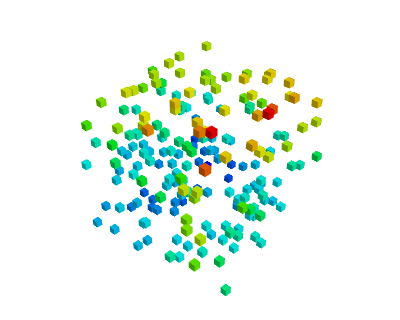 matplotlib can also do simple 3D plotting, but Mayavi relies on a more powerful engine ( VTK ) and is more suited to displaying large or complex data. The mayavi.mlab module provides simple plotting functions to apply to numpy arrays, similar to matplotlib or matlab’s plotting interface. Try using them in IPython, by starting IPython with the switch --gui=wx. 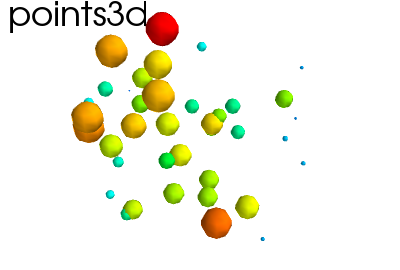 Points in 3D, represented with markers (or “glyphs”) and optionaly different sizes. 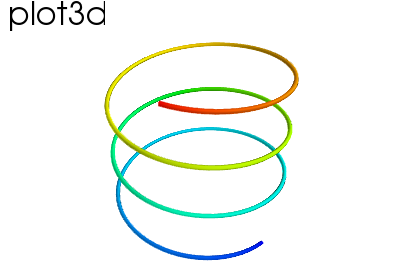 A line connecting points in 3D, with optional thickness and varying color. 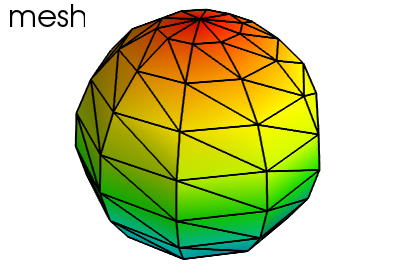 A surface is defined by points connected to form triangles or polygones. In mayavi.mlab.surf() and mayavi.mlab.mesh(), the connectivity is implicity given by the layout of the arrays. 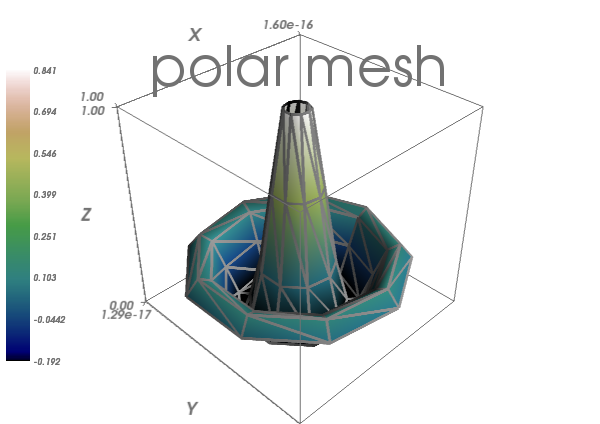 See also mayavi.mlab.triangular_mesh(). If your data is dense in 3D, it is more difficult to display. One option is to take iso-contours of the data. This function works with a regular orthogonal grid: the value array is a 3D array that gives the shape of the grid. In general, many properties of the various objects on the figure can be changed. If these visualization are created via mlab functions, the easiest way to change them is to use the keyword arguments of these functions, as described in the docstrings. Plots a surface using grid-spaced data supplied as 2D arrays. 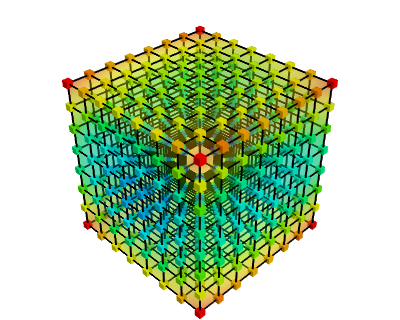 x, y, z are 2D arrays, all of the same shape, giving the positions of the vertices of the surface. The connectivity between these points is implied by the connectivity on the arrays. For simple structures (such as orthogonal grids) prefer the surf function, as it will create more efficient data structures. type of colormap to use. [xmin, xmax, ymin, ymax, zmin, zmax] Default is the x, y, z arrays extents. Use this to change the extent of the object created. boolean mask array to suppress some data points. If supplied, only one out of ‘mask_points’ data point is displayed. This option is usefull to reduce the number of points displayed on large datasets Must be an integer or None. the scaling mode for the glyphs (‘vector’, ‘scalar’, or ‘none’). make the opacity of the actor depend on the scalar. 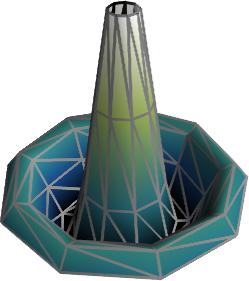 radius of the tubes used to represent the lines, in mesh mode. If None, simple lines are used. Different items can be added to the figure to carry extra information, such as a colorbar or a title. extent: If we specified extents for a plotting object, mlab.outline’ and `mlab.axes don’t get them by default. The quickest way to create beautiful visualization with Mayavi is probably to interactively tweak the various settings. Click on the ‘Mayavi’ button in the scene, and you can control properties of objects with dialogs. To find out what code can be used to program these changes, click on the red button as you modify those properties, and it will generate the corresponding lines of code. 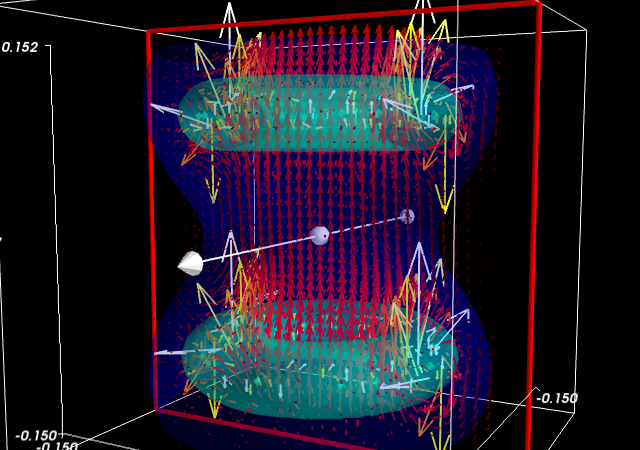 Suppose we are simulating the magnetic field generated by Helmholtz coils. The examples/compute_field.py script does this computation and gives you a B array, that is (3 x n), where the first axis is the direction of the field (Bx, By, Bz), and the second axis the index number of the point. Arrays X , Y and Z give the positions of these data points. Visualize this field. Your goal is to make sure that the simulation code is correct. 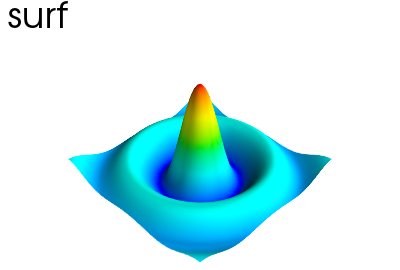 If you compute the norm of the vector field, you can apply an isosurface to it. using mayavi.mlab.quiver3d() you can plot vectors. You can also use the ‘masking’ options (in the GUI) to make the plot a bit less dense. As we see above, it may be desirable to look at the same data in different ways. 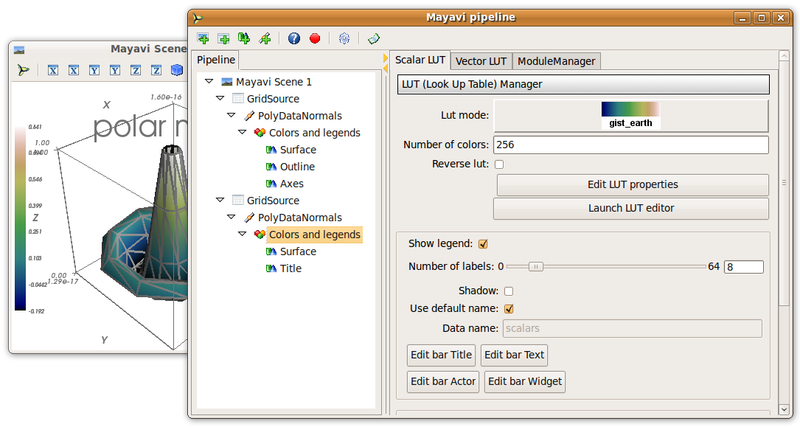 Mayavi visualization are created by loading the data in a data source and then displayed on the screen using modules. This can be seen by looking at the “pipeline” view. By right-clicking on the nodes of the pipeline, you can add new modules. Why is it not possible to add a VectorCutPlane to the vectors created by mayavi.mlab.quiver3d()? Data comes in different descriptions. A 3D block of regularly-spaced value is structured: it is easy to know how one measurement is related to another neighboring and how to continuously interpolate between these. We can call such data a field, borrowing from terminology used in physics, as it is continuously defined in space. A set of data points measured at random positions in a random order gives rise to much more difficult and ill-posed interpolation problems: the data structure itself does not tell us what are the neighbors of a data point. We call such data a scatter. Data sources corresponding to scatters can be created with mayavi.mlab.pipeline.scalar_scatter() or mayavi.mlab.pipeline.vector_scatter(); field data sources can be created with mlab.pipeline.scalar_field() or mlab.pipeline.vector_field(). Create a contour (for instance of the magnetic field norm) by using one of those functions and adding the right module by clicking on the GUI dialog. Create the right source to apply a ‘vector_cut_plane’ and reproduce the picture of the magnetic field shown previously. Note that one of the difficulties is providing the data in the right form (number of arrays, shape) to the functions. This is often the case with real-life data. Sources are described in details in the Mayavi manual. If you create a vector field, you may want to visualize the iso-contours of its magnitude. But the isosurface module can only be applied to scalar data, and not vector data. We can use a filter, ExtractVectorNorm to add this scalar value to the vector field. 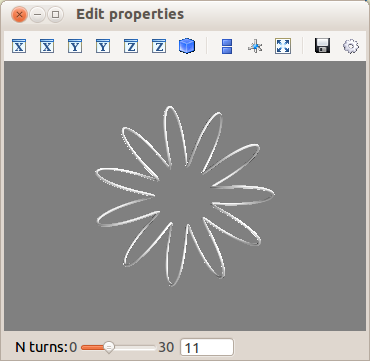 Using the GUI, add the ExtractVectorNorm filter to display iso-contours of the field magnitude. The mlab scripting layer builds pipelines for you. You can reproduce these pipelines programmatically with the mlab.pipeline interface: each step has a corresponding mlab.pipeline function (simply convert the name of the step to lower-case underscore-separated: ExtractVectorNorm gives extract_vector_norm). This function takes as an argument the node that it applies to, as well as optional parameters, and returns the new node. Using the mlab.pipeline interface, generate a complete visualization, with iso-contours of the field magnitude, and a vector cut plane. To make movies, or interactive application, you may want to change the data represented on a given visualization. It is very simple to make interactive dialogs with Mayavi using the Traits library (see the dedicated chapter Traits: building interactive dialogs). "The function creating the x, y, z coordinates needed to plot"
"The class that contains the dialog"
Let us read a bit the code above (examples/mlab_dialog.py). First, the curve function is used to compute the coordinate of the curve we want to plot. Second, the dialog is defined by an object inheriting from HasTraits, as it is done with Traits. The important point here is that a Mayavi scene is added as a specific Traits attribute (Instance). This is important for embedding it in the dialog. The view of this dialog is defined by the view attribute of the object. 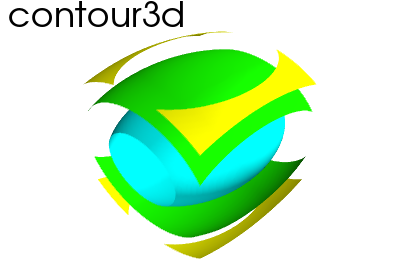 In the init of this object, we populate the 3D scene with a curve. Finally, the configure_traits method creates the dialog and starts the event loop. We can combine the Traits events handler with the mlab_source to modify the visualization with the dialog. to define an n_turns attribute on our visualization object, so that it can appear in the dialog. We use a Range type. to wire modification of this attribute to a recomputation of the curve. For this, we use the on_traits_change decorator. Full code of the example: examples/mlab_dialog.py. Using the code from the magnetic field simulation, create a dialog that enable to move the 2 coils: change their parameters. You can look at the example_coil_application.py to see a full-blown application for coil design in 270 lines of code.